General Hospital (GH) spoilers reveal that Jason Morgan’s identity will be revealed at last on this week’s new GH episodes. In a startling new GH promo BM’s Jason Morgan has an angry confrontation with SB’s Jason Morgan at the Port Charles Police Department, with BM Jason promising to SB Jason that no matter what the DNA says, they are not brothers. In this newly released GH promo preview video it appears that Samantha ”Sam” Morgan (Kelly Monaco) remains behind the man she currently believes to be her husband, Jason. 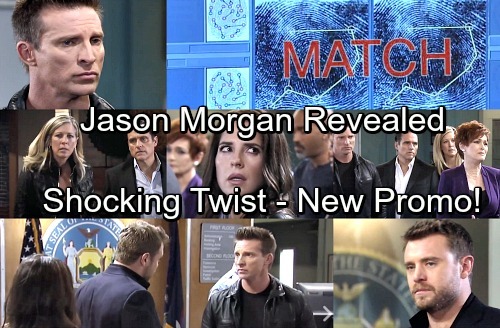 The Real Jason GH promo video teases that Attorney Diane Miller pushes whomever has the answers to which twin is which and stop playing games and reveal what they have the right to know; the computer screen flashes “MATCH” as friends and loved ones begin to gather and react in shock at the reveal of the real Jason Morgan. 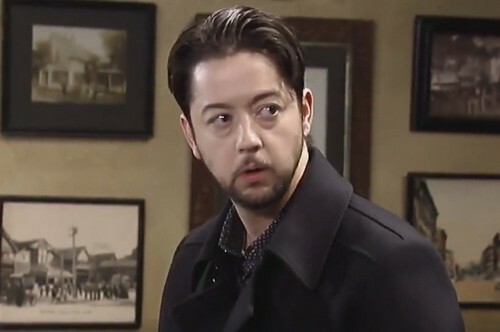 General Hospital spoilers reveal it will all end in a shocking twist, as GH fans catch a glimpse of Damien Spinelli (Bradford Anderson) and Dr. Kim Nero (Tarama Braun) and have to wonder what their involvement is in the revelation of the Moore twins and what is their connection to the “twin mapping”? Viewers of the ABC soap opera know that Spinelli is the “Jackal” when it comes the Internet and any dark secrets that would need to be uncovered. He is a dear friend of Sam and Jason (which ever man it may turn out to be); maybe he is the one who solves the mystery behind the “mapping” and will be able to uncover what truly happened and which Jason is the real Jason Morgan, as spoilers confirm that their true identities have been revealed! Who do you think is the real Jason Morgan and who is really Drew? How will Port Charles react to another twin mystery unfolding and yet another Quartermaine heir brought to town? No matter who is Jason and who is Drew they are both Quartermaines! Be sure to tune into ABC’s General Hospital (GH) this week, to watch as they reveal the identities of the Moore twins and which one is portrayed by Steve Burton and which one by Billy Miller – and how will this affect those who have loved them and continue to love them. Check CDL General Hospital spoilers often for updates, news, and reports.